BREAKING: Edward Snowden Re-emerg & Backs Wikileaks! He Confirms EVERYTHING! The Real Reason for the Trump Rally? EURUSD: When Price Pattern Trumps Other "Reasons"
Will Gold Continue to Drop? Rate Hikes, COMEX Shorts, Divergent Tops, Oh My!! Yet another election in which the EU hangs in the balance. Recent polls indicate that Marine Le Pen, the designated “populist" candidate, is falling behind. I have to ask, though, have we not learned our lesson yet on the meaninglessness of political polls? I think most of us have. In what could be the beginning of ripples from The Fed's jawboned 'certainty' of a March rate-hike, Chinese money market liquidity conditions appear to be drying up once again as overnight offshore yuan rates surge 142bps to one-month highs. At the same, spot offshore Yuan rates have plunged to their lowest since January 4th's massive short squeeze. The question is - will a sudden renewed but of volatility in credit markets (high yield crashed this week), commodity markets (crude and copper collapse this week), emerging market stocks (tumbling), and now China money markets, be enough to stall a determined Fed, and crush their credibility once and for all? Toronto-based Sprott Inc. said Wednesday it's making an all-share hostile takeover bid worth $3.1 billion US for rival bullion holder Central Fund of Canada Ltd. The money-management firm has filed an application with the Court of Queen's Bench of Alberta seeking to allow shareholders of Calgary-based Central Fund to swap their shares for ones in a newly-formed trust that would be substantially similar to Sprott's existing precious metal holding entities. "They weren't interested in having those discussions," Williams said. If successful through the courts, Sprott would then need the support of two-thirds of shareholder votes to close the takeover deal, but there's no guarantee they will make it that far. "It is unusual to go this route," said Williams. "There's no specific precedent where this has worked." The firm says Central Fund's shares are trading at a discount to net asset value and a takeover by Sprott could unlock US$304 million in shareholder value. Sprott's existing precious metal holding companies are designed to allow investors to own gold and other metals without having to worry about taking care of the physical bullion. PHOENIX -- Invoking claims of illegally printed paper money, the use of gold in the Bible and even foreign entanglements, former Congressman Ron Paul urged Arizona lawmakers Wednesday to let coin collectors and investors escape the state's capital gains tax. Paul, a three-time presidential hopeful, told members of the Senate Finance Committee it's not fair or even legal from his perspective for the government to take its share when someone who bought a coin at $300 later sells it for $1,200. He said the value of the coin really remains the same. It's the value of that paper money -- money he contends is "fraud" -- that's gone down. Paul's testimony helped buttress similar claims by Rep. Mark Finchem, R-Oro Valley, who already has ushered the tax break in HB 2014 through the House. The result was the Senate panel giving its OK on a 4-3 party-line vote and sending it to the full Senate. But the real hurdle remains Republican Gov. Doug Ducey who vetoed similar measures in 2015 and again last year saying he feared the unintended consequences of such a change in tax law. That isn't a unique concern. In 2013, Republican Jan Brewer also used her veto stamp. "This would result in lost revenue to the state, while giving businesses that buy and sell collectible coins or currency originally authorized by Congress an unfair advantage," she wrote at the time. That was exactly the complaint made Wednesday by Sen. Steve Farley, D-Tucson, in urging colleagues to kill the measure. He said the legislation would make sense if a $20 gold piece sold for $20 in what most people recognize as legal currency. But what it sells for, Farley said, is based on a combination of the amount of precious metal, the condition of the coin and the demand for what might be a rare coin. "So to give someone a capital gains tax break on the money they make ... from selling that coin seems like just simply a tax giveaway that other people would be paying for because we're going to need to get enough money to pay for our roads and schools anyway," Farley said. "Why does the government need the money is the big question," Paul said. Anyway, he said, if the government needs money it should tax people "more honestly" than by making them pay capital gains for their efforts to protect themselves against inflation. Farley, for his part, said the flaw in the arguments by supporters of the legislation is that somehow the type of investment decision should govern its tax liability. "There's a lot of places people can decide to invest their money as a hedge against inflation," he said. "You can invest it in stocks, you can invest it in real estate, your house, a lot of other things," Farley continued. "That also goes up in value over time and that represents, at least in some part, inflation." The difference here, Farley said, is that people pay capital gains taxes when they sell a stock or any other investment for a profit; this bill creates a special exemption for gold and silver coins. "So to me that's picking winners and losers," he told the former Texas congressman. "I understand your point," Paul responded. "But the important point is stocks are not money and gold and silver are money." And that goes to his contention that there's no legal basis for all this paper money out there. "Congress is allowed to coin money," Paul said. "They don't have the authority to print money." One thing the panel did not consider is what would be the cost to the state of such an exemption. No one was able to provide a figure of the tax implications of such an exemption. This post The Real Reason for the Trump Rally? appeared first on Daily Reckoning. We like to nose around obscure crannies of the financial press. Among these lonely crags, we find rare clues, half-buried pearls… far away from the Page 1 hustle and bustle. It suggests the post-election Trump "reflation trade" may have been not a sign of economic vigor but a phantom rally, wispy as the morning fog and about as lasting. Another red day on Wall Street. The Dow's down 69, to 20,855. The S&P's off five points. But take heart — the Nasdaq's up… three whole points. Oil's off three bucks. And gold's down about eight, probably on word that fed funds futures are now suggesting a 100% chance of a rate hike next week. Why 100%? New data from ADP Research indicate the private sector added a thumping 298,000 jobs in February. The sages and soothsayers hazarded only 190,000. It seems only an act of the Big Fellow himself could stop a rate hike now. But maybe Ms. Yellen and co. should gander a report by Gavekal Capital: "A Massive Liquidity Illusion." The report suggests this massive liquidity illusion is a "really important element missing from this [mainstream] analysis." And it could "change very quickly over the next several weeks." To prepare for the March 15 debt ceiling, the Treasury's been drawing down its deposits held at the Federal Reserve. In 2015 — the last time the debt ceiling was suspended — Congress passed a law prohibiting the Treasury from squirreling away large cash reserves to prepare for the debt ceiling. A large cash reserve could keep the Treasury in funds for months and months, dragging the thing out. And since November, reads the report, U.S. Treasury deposits at the Fed have dropped from over $400 billion to about $175 billion. Just as the law required. Further driving home the nail: "To be clear, the increase in bank reserves is entirely a function of the U.S. Treasury making preparations to hit the debt ceiling in the next couple months." The report says the process has unleashed over $200 billion of liquidity into the markets these past few months — a smaller-scale round of quantitative easing. That rising tide of liquidity "has served to create the appearance that the Federal Reserve has been easing lately." "The net effect of this," concludes the report, "is an unintended liquidity injection into the economy." The Dow's up a meteoric 3,000 points since the beginning of November — among its most dramatic three-month runs ever. Let's say the debt ceiling is raised and the U.S. Treasury wants to rebuild its account at the Fed [as it did after the 2011 debt ceiling crisis]. The U.S. Treasury will then issue a bunch of bonds, stick the proceeds at the Fed and basically remove several hundred billion in liquidity from the markets. This will manifest itself in lower commercial bank deposits at the Fed and a reduction in banking liquidity. "Experience over the last few years is that each major reduction in commercial bank reserves leads to… a stumble in stocks." But experience runs a hard school, as old Ben Franklin said. "Fools will learn in no other." The post The Real Reason for the Trump Rally? appeared first on Daily Reckoning. This post This Mini-Bubble Could Burst at Any Moment appeared first on Daily Reckoning. Whenever stocks rise sharply for a sustained period, or rise more than a few days or weeks in a row, as had been the case until these past few days, there is always some pundit quick to label the trend a "bubble" and advise investors to run for the exits. Usually the pundits are wrong. Most so-called bubbles are not bubbles at all, they're just short-term trends driven by sentiment or momentum. Those trends may slow down or even reverse, but they don't burst catastrophically the way real bubbles do. So pundits who yell "bubble" too often are marginalized as doom-and-gloomers, perma-bears, or the boy who cried wolf. They do burst suddenly and catastrophically, and most investors do lose fortunes when they burst. The art of analysis consists of recognizing the difference between real bubbles and mere short-term trends. My job is to use the right tools to spot real bubbles, and warn readers in time to avoid losses and even make gains as markets are crashing. U.S. equity markets today are flashing red when it comes to bubble potential. True bubbles happen for a variety of fundamental and psychological reasons. Below are two of the most famous stock charts in history. Chart 1 traces the Japanese stock bubble of 1983 to 1989, which resulted in a spectacular collapse of the Nikkei 225 Index beginning on January 1, 1990. Famously, that Japanese bubble included real estate as well as stocks. In 1989, the land inside the Imperial Palace Walls in central Tokyo (a three-mile circumference) was said to be worth more than all the land in California. At the end of Japan's lost decade, the Nikkei Index stood almost 75% below the peak it reached in late 1989. Chart 2 is the U.S. stock bubble of the "Roaring Twenties" as shown in the Dow Jones Industrial Average. That crash began on October 24, 1929 ("Black Thursday") and reached a crescendo on October 29, 1929 ("Black Tuesday"). The 1929 crash ushered in the Great Depression, which persisted until 1940. At the lows, the Dow Jones index had fallen more than 85% from the 1929 high. Stocks did not recover their pre-crash levels until 1954, a full quarter-century after the crash. The bubble dynamics are easily seen from these charts. Bubbles do not emerge from depressed conditions or prior collapse. The memories of prior losses are usually enough to prevent investors from engaging in bubble behavior. Instead, bubbles follow periods of growth and persistent stock market gains. The original stock gains are based on fundamentals. Japan in the 1980s and the U.S. in the 1920s were both highly productive and fast-growing economies. Stock market gains made perfect sense. Bubbles emerge at the end of long expansions when memories of the last crash fade, and euphoria replaces common sense. At that stage, the slope of the market index curve steepens at an accelerating rate. The chart no longer rises gently; it rises vertically in a hyperbolic fashion. The result is the famous "hockey stick" image of a gently sloping base with a steeply sloping handle. That is visible in both Chart 1 and Chart 2. The other characteristic of bubbles is that they persist much longer than many observers expect. 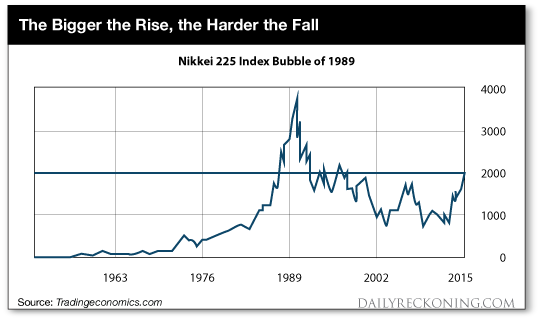 It would have been easy (and not wrong) to yell, "bubble" in the U.S. in late 1928 or in Japan in late 1988. Yet markets powered higher despite the warnings. Those who issue early warnings are regarded as cranks. Those who short the market too soon can lose their shirts. Yet, those issuing warnings ultimately proved correct. Is the stock market in a bubble now? 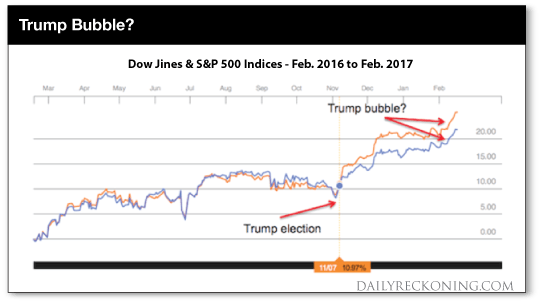 Has the "Trump Trade" resulted in the same bubble dynamics we saw in 1929 and 1989? 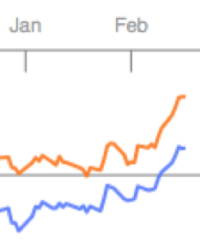 Superficially, Chart 3 does not exhibit the extreme hockey stick behavior of Charts 1 and 2. It's true that stocks have been rallying since Trump's election. But Chart 3 covers only a one year period, compared with the five year build-up to the 1929 and 1989 crashes. This goes to the point that bubbles persist much longer than investors expect. Based on the history of 1929 and 1989, an analyst might expect a bubble bursting in 2020 from a level of Dow 50,000! That might even be a good prediction, but investors who sit on the sidelines until 2020 could miss the greatest market rally in history. But, there's a lot more to dynamic systems analysis than superficial chart comparisons. For a short-term prediction, it's helpful to utilize the concept of scale-invariance. This concept applies to complex systems such as capital markets, and derives from fractal mathematics. Scale-invariance simply means that the same patterns repeat themselves at all scales large and small. The images below are a good example of scale-invariance in nature. If you look at the leaf on the left, you'll notice that the individual petals on the leaf are exact replicas of the leaf as a whole. Look closer and you'll see that the petals have separate offshoots that are exact replicas of the petal, and so on. 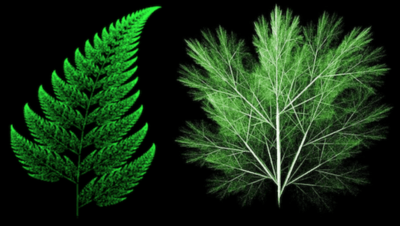 The basic shape of the leaf repeats itself at progressively smaller scales. The same is true in the spiky bush on the right. You'll notice that the pattern of large spikes with small spikes sticking out and smaller spikes sticking out is repeated over-and-over at every scale. Scale-invariance is ubiquitous in nature and can be seen in everything from sand ripples to waves, mountain ranges and the shapes of clouds. Guess what? Research proves that scale invariance applies to the time series of stock prices also. Stock markets are complex systems that behave just like many natural systems. In fact, stocks markets can be regarded as a "natural" system because their patterns are dictated by human behavior and human nature. Scale invariance metrics teach us that there can be many "mini-crashes" that exactly resemble the great crashes on a smaller scale. This is exactly like the small leaf petals that closely resemble the larger leaf in nature. We don't have to conclude that the Dow Jones will crash 80% to Dow 4,000 (it might someday, but probably not yet). Scale invariance teaches that a mini-crash could cause the Dow to give up 80% of its gains since January 1, 2017, which would put it down almost 700 points to 19,935. A comparable drop would push the S&P 500 down 90 points to the 2,260 level. Both corrections would be "80% crashes," but the 80% would be measured on a smaller segment of the timeline. That's exactly what scale-invariance says to look for. What could trigger such a mini-crash? There's a long list of potential catalysts, including delays and disappointments with Trump's economic plans, aggressive rate hikes by the Fed, a stronger dollar, and economic turmoil due to China's vanishing reserves, a new Greek bailout or rising geopolitical tensions. The cause of the bubble burst is less important than the initial condition of the bubble. The stock market is exhibiting a small-scale bubble formation ready to burst at the first sign of stress. This is not the "mother of all bubbles." That may come in time. For now, it's a clear "mini-bubble" that exhibits the same dynamics as a larger bubble, but on a smaller scale. Bond market signals are contradicting signals from the stock market, which recently had the most consecutive days of new highs since 1987. In effect, the stock market is betting on stronger growth, while the bond market is betting on economic cooling. The bond market has a much better track record of predicting economic turns than the stock market. This recent bond market rally suggests stocks are due for a correction. 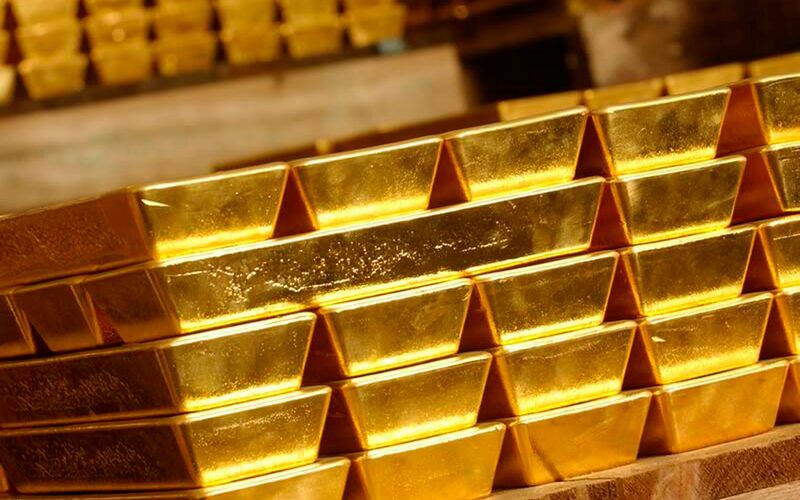 Many consider gold the ultimate safe haven asset. And all these factors have increased the attraction of gold as a safe haven asset. The post This Mini-Bubble Could Burst at Any Moment appeared first on Daily Reckoning. Gold fell $9 to $1206.80 in early New York trade before it chopped back higher into the close, but it still ended with a loss of 0.58%. Silver slipped to as low as $17.213 and ended with a loss of 1.37%. Given the big down move this week in the precious metals, it would certainly follow that the activities of the Commercials would be no surprise. They matched all of the demand brought to bear on the Crimex gold pit by selling over 40,000 contracts representing over 4,000,000 ounces of synthetic gold, and then nudged the gold market off the ledge. They did it with much-revered aplomb, but nowhere more daunting than in the nearly $1.00 collapse in silver that had the blogosphere buzzing last week. Most analysis of gold and silver markets tends to be U.S.-centric. However, the next secular trend in precious metals markets may have less to do with U.S. debt, U.S. politics, the U.S. central bank, and the U.S. dollar and more to do with a gigantic new source of demand. It’s not the 1970s anymore. Back then, big moves in the metals markets were centered on United States. The great gold and silver mania of the late 1970s was driven by inflation fears and a rush of speculative demand. Although coin dealers struggled to keep up, there was no actual global shortage of physical metal, and spot prices crashed after manic buying peaked in January 1980. This post 1 Bitcoin = 1 Oz. Gold? appeared first on Daily Reckoning. Today, one bitcoin is trading for the same price as an ounce of gold. The price of bitcoin has surged almost 200% over the past year. Yet some experts think the cryptocurrency is still too cheap. I'm not certain bitcoin can continue to rise uninterrupted at its current pace. But we are seeing more developments in the global war on cash that could act as powerful price catalysts. China's crackdown on money laundering and demonetization in India have both help increase bitcoin's popularity as a store of value, CNBC notes. But until we see some more traditional means of trading bitcoin, we're going to stick to the mainstream alternative payment investments. If you're looking to ditch cash but you don't have any interest in figuring out how to open a bitcoin wallet, PayPal's popular new payment app has a solution for you. The app is called Venmo—and it's quickly becoming an everyday name in the mobile payments game. Getting started is as easy as adding a new credit card to your Amazon account. The app automatically syncs your contacts through your phone. Then you're ready to make payments to friends, coworkers, and family. To make a payment, all you have to do is pick up your phone. No checks, cards, or cash necessary. It's that simple. Folks are using the app for everything from buying a cup of coffee to paying rent. You can fight this powerful trend. Or you can profit from it. Right now you have a shot at a white-knuckle ride as the use of mobile payment platforms begins to skyrocket. Of course, PayPal isn't the only player in the game. Other major players are going to step up and challenge Venmo in the very near future. There's Zelle, the brainchild of Bank of America, Wells Fargo, and JPMorgan that is desperately trying to grab some attention before its official launch. Apple Pay transactions totaled nearly $11 billion last year, barely beating the $10.2 billion in payments processed by Square Inc. (NYSE:SQ). 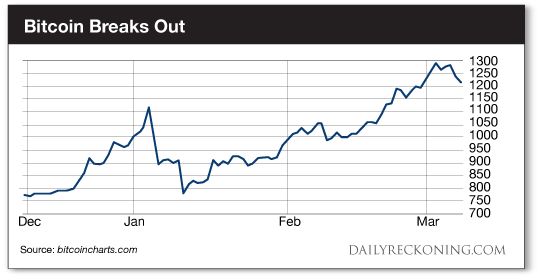 But when it comes to explosive growth, PayPal Holdings (NASDAQ:PYPL) is our top pick. Late last year, PayPal reported that its active customer accounts rose 11% to 192 million. The number of average transactions per active account increased. Mobile payment volume is way up, jumped more than 50% to $26 billion in the third quarter. Oh, and it doesn't hurt that mobile payment snow make up nearly 30% of PayPal's business. PayPal has also teamed up with Facebook and even Snapchat in the latest innovations for peer-to-peer payments. These partnerships should have a big impact on PayPal's growth over the next couple of years as more consumers flock to mobile payment options. The post 1 Bitcoin = 1 Oz. Gold? appeared first on Daily Reckoning. Hey! Look! Here I am! Over here! I'm back! (Sound of thunderous applause). Thanks! Wonderful to be here! I know that you, like most people, are probably scratching your head quizzically, asking yourself "Who is this doofus who calls himself Mighty Magnificent Mogambo in the next paragraph, which doesn't even make sense? And who cares that he is back, which is not to mention why am I reading this stupid crap in the first freaking place?" Forecast A strong dollar will undermine U.S. President Donald Trump's plans to reduce the United States' trade deficit. If the dollar's value continues to rise, Trump may consider unilateral or, failing that, multilateral currency interventions to bring it back down. Negotiating a new coordinated monetary intervention in the spirit of the 1985 Plaza Accord will be onerous, however. Gold imports by India, which competes with China for the role of world's biggest consumer, are said to have risen almost three-fold in February from a year earlier as jewelers increased stockpiles before the festival and wedding period that starts next month. Precious metals expert Michael Ballanger reflects on the cause of this week's decline in precious metals markets, and contemplates the factors that will help him determine a bottom.